My first Christmas theme bento begins with the Santa Claus laundry. He is getting ready for Christmas and so are we. Couldn't get so much light this morning, so the picture is a bit dark. Andrew was sick from yesterday so he is staying at home. He woke up at the same time with me this morning. Later he just went back and forth between the living room and the kitchen to do the 'quality control' for this bento LOL :D He kept saying easy to me and he wanted to help to make this bento. I gave him one egg to brake in a small bowl and he literally broke it and spilled half in the small bowl and the other half on the kitchen table. This morning my level of patient was very high, so I just tidied up for him. After that what he did was supervising me when I cut the egg sheet free hand with my X-Acto knife. Oh boy! He was the boss this morning in the kitchen. Inside the other box : braised chicken & potatoes, stir fried baby bok choy & fish cake, and small mandarin orange. Linked this bento to What's For Lunch every Wednesday. That is so so so nice! Love it. Even Santa has to do laundry, hehe! So glad it seems Andrew is doing better, well enough to supervise you in the bentomaking. Hope he continues to improve! 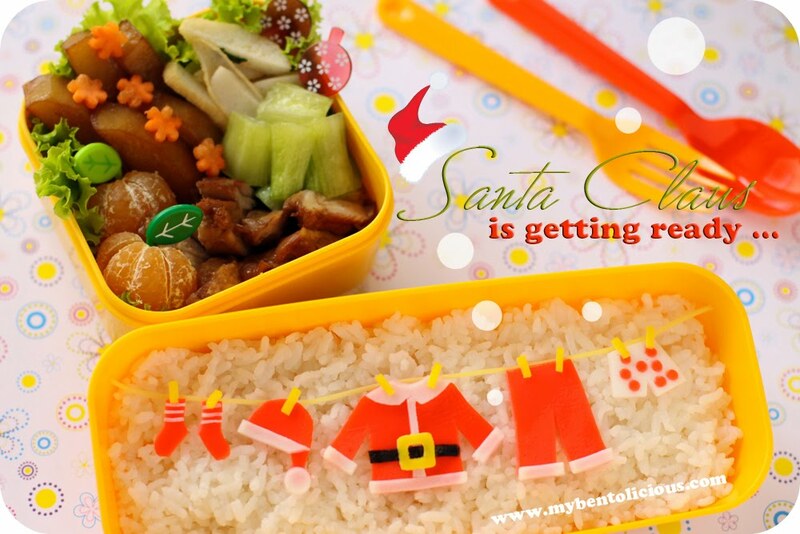 Can't even begin to think of Christmas, but your bento gets me in the mood already! aw, this is too cute. Lia, i cant stop smiling when i saw your bento..
its so cute. the tiny little Santa clothes. Me too are going to experience some Christmas atmosphere,deco and lightings soon..
@sherimiya : hahaha ... Yes, he has too in order to set a good example for the elves. Yesterday, Andrew has been whining a lot. And today I think he just bored at home without his sister. So I became his target :p But the fever is gone today, so I'm glad. @javapot : Thanks a lot! Such a great idea! A creative way to "say" Christmas is coming soon :D Setuju sama Andrew, polka dot underwear-nya lucu! Really glad to hear is doing better Lia! @Anncoo : So sweet of you ... Thanks a lot Ann! Your Santa Laundry is amazing! I am in awe of your talent! It is so cute that Andrew is so interested in his bento! Hope he's feeling better! That is great! I really like that laundry. Very creative. so cute! this could be a holiday card!! @leeswammes : Thanks a lot! @Jun @ IndoChine Kitchen : hahaha ... Thanks a lot Jun! @Sonja : Thanks a lot Sonja! Awesome, what a adorable Christmas bento idea, Lia! As usual your inspirations and beautiful creations lead the pack! This is so cute and nice! May I know how u fixed the clothes pin so that it won't messy up while carrying? Wow you are fantastic! I absolutely love this one. It's got to be my most favourite bento ever! U make it sound so easy... but I don't have skilled fingers like you. I think this is going to be the coolest Christmas bento of the whole year!! Not only is it an wonderfully creative idea but you are so talented at creating egg sheet magic! I guess this settles the question of whether Santa wears boxers or briefs. Although I would have died laughing if you had put tightie whities on the clothes line. Love this bento, Lia! So cute! You are a very happy and patient mama!! your kids are the luckiest!! Wow such a cute bento!! @Mi : Thanks a lot Mi!